Revenue in the Carbonated Soft Drinks segment amounts to US$225,753m in 2019. The market is expected to grow annually by 3.7% (CAGR 2019-2023). In global comparison, most revenue is generated in United States (US$68,774m in 2019). In relation to total population figures, per person revenues of US$30.67 are generated in 2019. The average per capita consumption stands at 28.1 L in 2019. Carbonated Soft Drinks here denote all artificially sweetened and carbonated Non-Alcoholic Drinks. This encompasses cola beverages, tonic waters, lemonades as well as energy and sports drinks. The added carbon dioxide gas provides the sparkling taste of these beverages and also prevents spoilage. While the category is still emerging in the rapidly developing markets of the Asia-Pacific region, it has already surpassed its apex in the mature markets of the West. In the home country of Coca-Cola, soda sales, while still the highest in the world, have declined for more than ten years in a row now. The main challenge for the industry in the coming years will be to react to consumers‘ growing sophistication and stricter regulation as more and more states and municipal governments are imposing soda or sugar taxes to curb consumption. The focus on the development of new artifical sweeteners like Stevia are testament to this development. A possible alternative course of action would be a shift to beverage categories that rely less on sugar for flavouring like ready-to-drink (RTD) tea and coffee beverages. Contrary to the category trend, the segment of sport and energy drinks has enjoyed spectacular growth in recent years as the success of Austria’s Red Bull and the US’s Monster can attest. The success of these functional beverages shows that growth is possible for carbonates if brands can move beyond mere refreshment and provide additional use for consumers. The market for Non-Alcoholic Drinks is structured into off-trade sales (in stores) and on-trade sales (in bars, restaurants etc.). Statista values off-trade sales at retail prices (including sales taxes or VAT) and on-trade sales at wholesale prices. Additional markups for hospitality services are therefore not taken into account. Reading Support Revenue in the Carbonated Soft Drinks segment amounts to US$225,753m in 2019. 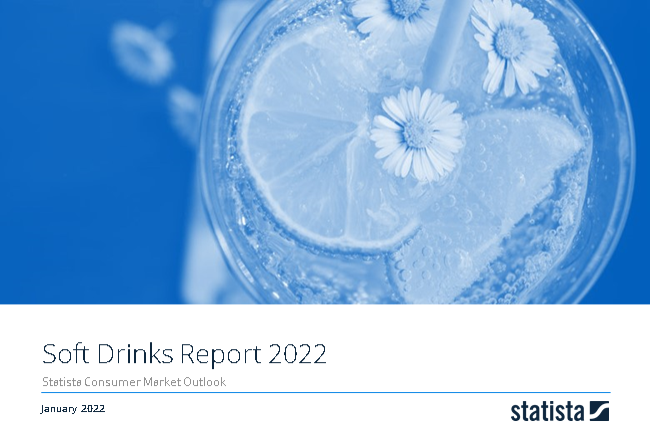 Reading Support The Carbonated Soft Drinks segment is expected to show a revenue growth of 4.1% in 2020. Reading Support The average revenue per person in the market for Carbonated Soft Drinks amounts to US$30.67 in 2019. Reading Support In the market for Carbonated Soft Drinks, volume is expected to amount to 216,537.6 ML by 2023. Reading Support The market for Carbonated Soft Drinks is expected to show a volume growth of 1.2% in 2020. Reading Support The average volume per person in the market for Carbonated Soft Drinks amounts to 28.1 L in 2019. Reading Support The average price per unit in the market for Carbonated Soft Drinks amounts to US$1.09 in 2019. Reading Support With a market volume of US$68,774m in 2019, most revenue is generated in United States. Here you can find more studies and statistics about "Carbonated Soft Drinks".